Enamored with Mendocino County, its wild Pacific coast, wind-bent cypresses and towering redwoods, roaring waves, and squeaking seagulls, I never miss a chance to visit this magnificent part of Northern California. This year, the occasion was enormously grand – I joined the ranks of the judges for the 19th annual Crab, Wine & Beer Festival benefiting Mendocino Coast Clinics. My husband and I embarked on a road trip from our San Francisco Bay Area home early in the morning, not to miss the many opportunities of frequent stops along the coast – to look at the ocean, to walk on a trail framed by flowering aloe vera, or to swerve into a quaint little town for some good coffee and street art viewing. By the time we’ve reached our destination – the newly opened Noyo Harbor Inn in Fort Bragg – a lavish reception for the crab fest judges, organized by the Inn’s management and Visit Mendocino County staff was about to start. We were greeted by the festival organizers, treated to the wonderful local wines and delicious bites, and instructed on the next two days’ itinerary. When we ventured upstairs to our room I clung to the window overlooking the Noyo Harbor – serene and pearly-gray in the approaching sunset under the cloudy sky. Enchanted, I observed a few seagulls gliding on the water, and a couple of sea lions cavorting by the docks. 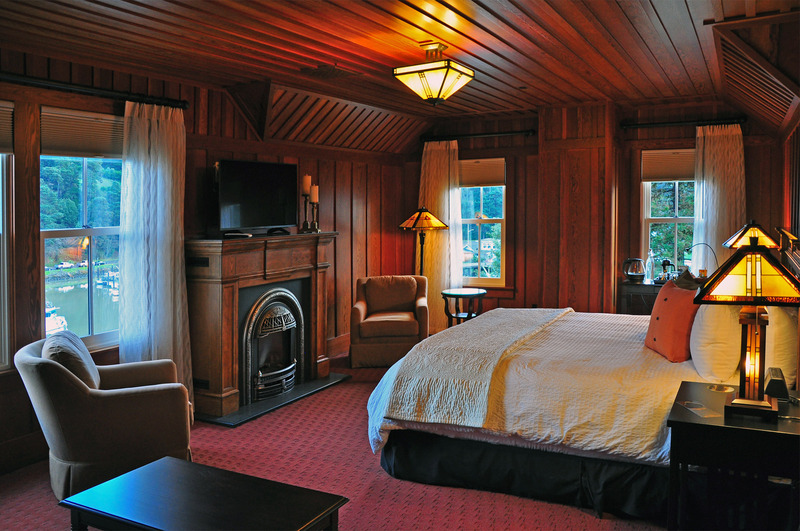 Our suite was spacious, lovely, beautifully appointed with hand crafted wood panels, plush furniture, Mission Prairie style lamps, and a gas fireplace with intricate metalwork. By the window, an electric teapot, brand name tea packets, and French press coffee were neatly placed on a little table. In a full-size bathroom there was a large soaking tub. We could’ve slept in our comfortable bed for many hours, but the harbor view right before dawn with crab fishermen getting in the ready on their boats was too gorgeous to miss. After a well-served breakfast at the cozy Noyo Harbor Inn Restaurant we were ready for the day. As the 2018 Crab, Wine & Beer Festival judges we were participating in an important fundraiser helping to raise money for the Mendocino Coast Clinics, a non-profit, board-governed community health center that provides medical, dental, perinatal and behavioral health care to all Mendocino coast residents and visitors, regardless of their ability to pay. Our first order of the day was to tour the sparkling-clean, highly-efficient medical facility with Lucresha Renteria, Executive Director, and to meet with Lawrence Goldyn, the Medical Director of the Mendocino Coast Clinics. We were thoroughly impressed with the impeccable state of the buildings, the roster of medical services, the abundant financial support available to low-income patients, and the overall feel of a close-knit community of deeply engaged caring people. A crab fest poster, attached to the announcement board, reminded the Clinics visitors where they have to hurry for the upcoming weekend. 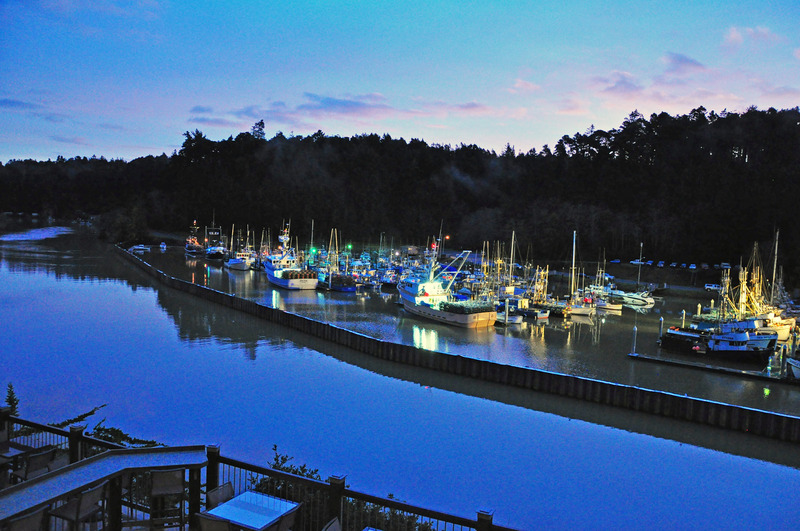 Inspired by the wonderful goals reachable through popular events like our eagerly-anticipated crab fest, we headed for our first judging session to the Little River Inn in the town of Little River. The white cottages and emerald-green lawns of the Inn, splashed by the recent rain shower, greeted us with a double rainbow across the sky – definitely a good omen! At the Little River Inn’s Abalone conference room we were first outfitted with the special goofy crab hats, and then seated around a table with multiple wine glasses in front of every judge. That was the wine tasting portion of the judging – we were supposed to blind-taste 40 wines in eight flights, including sparkling wines, chardonnay, sauvignon blanc, pinot blanc, Riesling, gewürztraminer, and rosé to identify not just the best tasting wines, but the ones best paired with Dungeness crab. 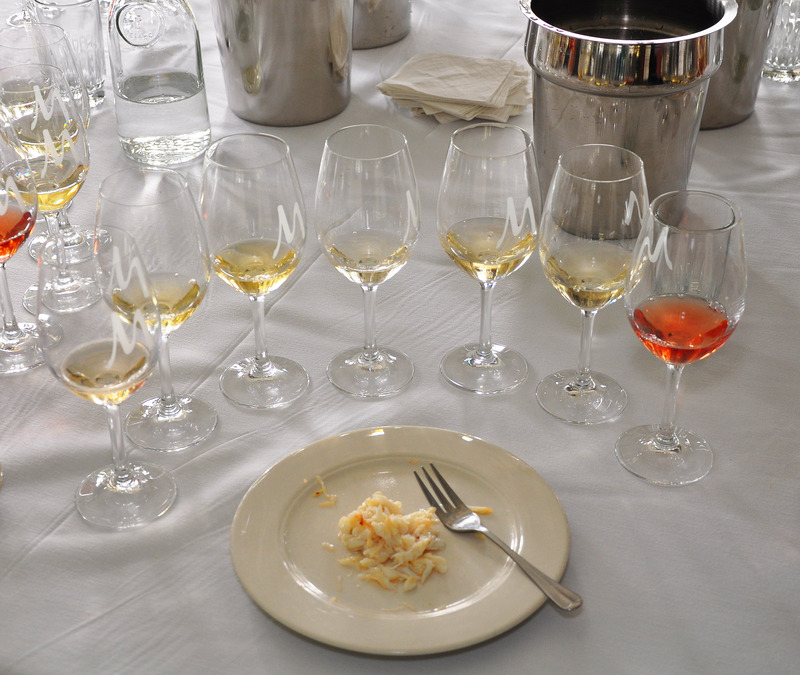 Freshly cooked and cleaned, the succulent chunks of sweet California crab arrived in little plates in front of each judge, while the festival volunteers were pouring the wines, produced mostly in the immediate Mendocino area. The three winning wines were decided upon by the majority of votes, while many of us were having a really hard time making our preferences. By naming the winners here I only want to stick to the facts, not to imply that all other participating wines lacked in anything! That was really an exquisitely capable selection of the best California whites and rosés! The First place was given to 2016 Husch Vineyards sauvignon blanc, the Second place to 2016 Handley Cellars Riesling, and the Third place to 2015 Yorkville Cellars organic Semillon produced in Anderson Valley. That same evening, we were hospitably invited to the Mendocino Coast Clinics Cioppino Dinner – a family-style celebration for hundreds of local residents, and also a fundraiser at which the Clinics directors, staff, and countless volunteers served piping-hot bowls of seafood stew from a gigantic vat attended by a cool-looking beer-in-hand Cioppino Chef James Hoffman. The main event of the Festival, Crab Cake Cook-Off and Wine Tasting Competition, was happening the next day, on a Saturday, in downtown Fort Bragg, in The Big White Tent with a “Sold Out!” sign in front of it. Once again we, the judges, were seated around a big table and supplied with numbered graphs to take notes of the 17(!) 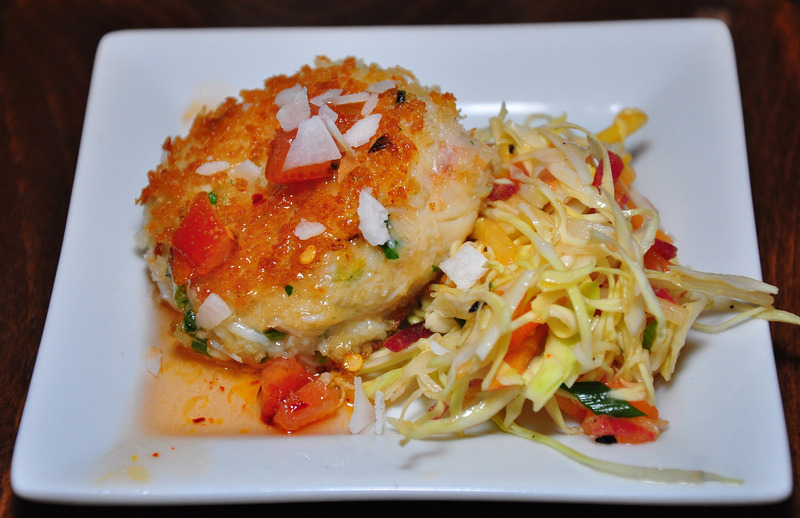 competing crab cakes coming from the ambitious chefs of the best Mendocino inns, hotels, restaurants, and wineries. 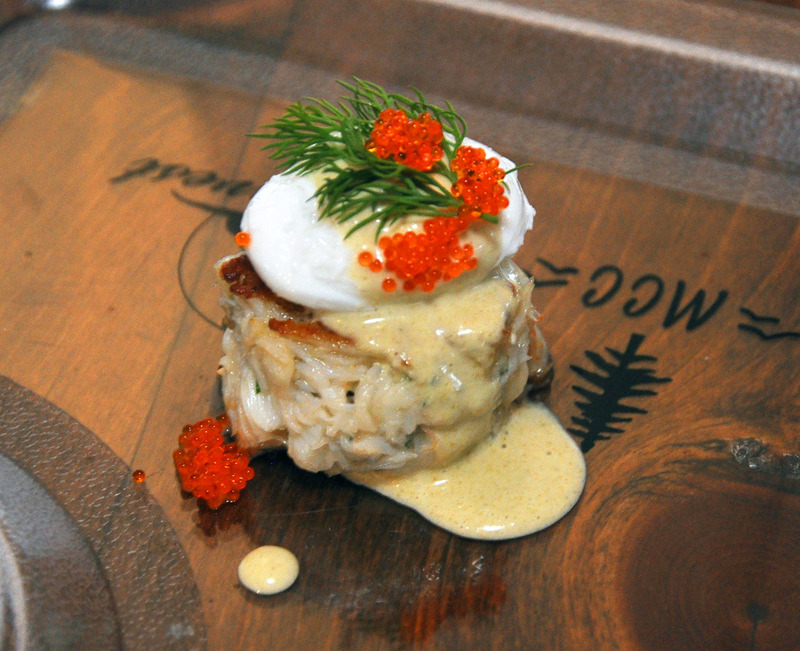 All imaginable varieties of crab cakes – from lightly- to heavily breaded, from embellished with soft-cooked egg and caviar to smothered in chipotle mayo, and garnished with a variety of sides, like coleslaw, citrus fruit, watercress and microgreens, were brought to our table, some artistically plated, even though the plating was intentionally left out of the score to help us concentrate on the taste and texture of the chefs’ creations. Once again, the task to pick and choose the winners was not easy. After thorough consideration, the First place was taken by Chef Marc Dym of Little River Inn in Little River, Second place – Chef Andrew Wells of Mendocino Jams & Preserves, and Third place was a tie between Chef Willy Real of Noyo River Grill in Noyo, and Chef Taylor Pedersen of Ukiah Brewing Company in Ukiah. For my readers’ sake, I’m listing all the other chefs and their respective venues, so when you’ll be driving to Mendocino (hopefully soon!) 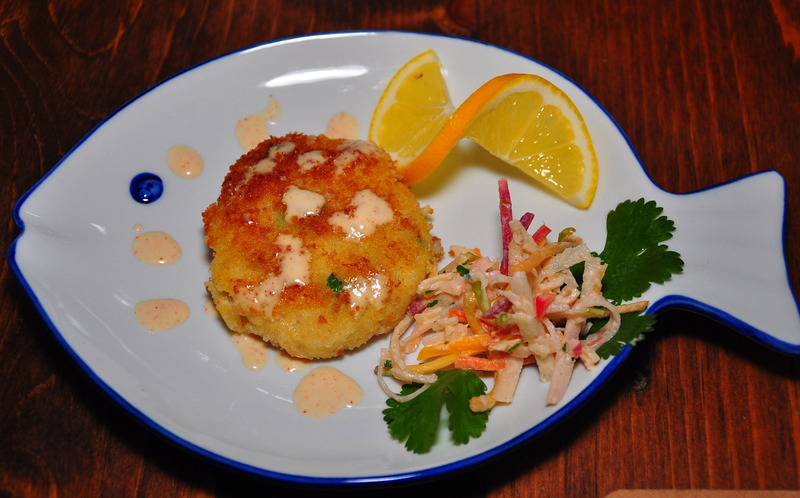 you’ll know where to look for the succulent crab cakes and other delicious local fare. The crab cake competition chefs (from Mendocino when location isn’t mentioned): Adam Celaya of Adam’s Restaurant in Willits, Julia Kendrick Conway of Assaggiare Mendocino in Fort Bragg, Jim Modesitt of Maple Creek Winery in Yorkville, Victor Hugo Aguirre and Joe Niesyn of Brewery Gulch Inn, Julian Lopez of Café Beaujolais, Miguel Mex of Café 1 in Fort Bragg, Joe Harris of Cucina Verona in Fort Bragg, Richard Scott Klaisner of The Golden Pig in Hopland, Margaret Fox of Harvest Market in Fort Bragg and Mendocino, Jon Krebs (individual master-chef) from Fort Bragg, Fabrice Dubuc of Noyo Harbor Inn in Fort Bragg, Singyn Hunter of The Inn at Newport Ranch in Westport, Mayra Ahumada and Carlos Villafania of The Q BBQ in Fort Bragg. There were also People’s Choice Awards. 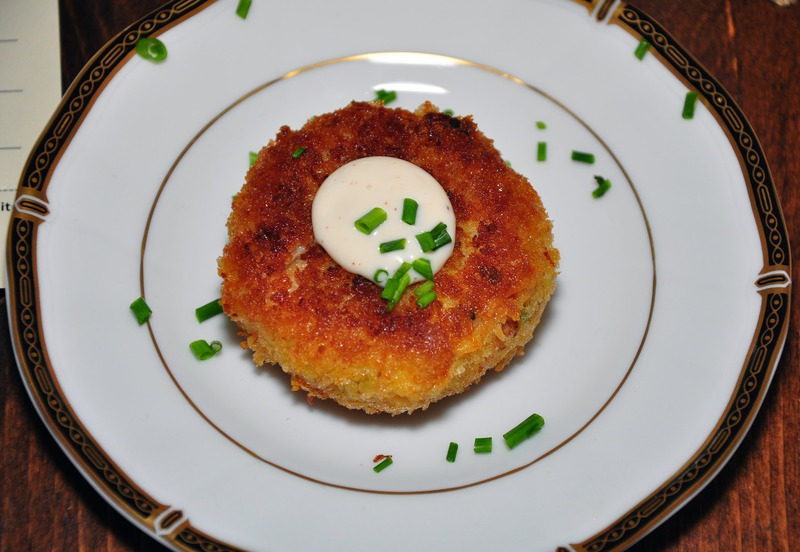 The Best Crab Cakes: First place – Chef Jim Modesitt of Maple Creek Winery, Second place – Chef Taylor Pedersen of Ukiah Brewing Company, and Third place – Chef Marc Dym of Little River Inn. The Best Winery: First place – Maple Creek Winery, Second place – Toulouse Vineyards, and Third place – Scharffenberger Cellars. As a result of the Festival fundraiser and generous donations from its participants, Mendocino Coast Clinics has reached a new record high of more than $150,000 (www.mendocinocoastclinics.org). The 20th annual Crab, Wine & Beer Festival is scheduled for January 25-26, 2019. Online ticket sales start on October 15, 2018. The annual Crab, Wine & Beer Festival is only one of the many culinary-, arts- and sports- events happening in Mendocino County all year round. Find additional information at: www.visitmendocino.com.